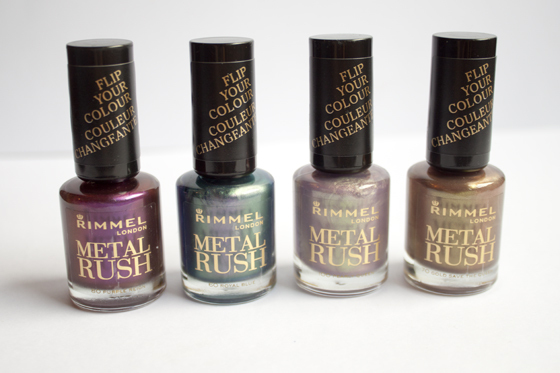 For Autumn/Winter 2012 Rimmerl have launched a new collection of on trend nail polishes called Metal Rush Nail Polishes. These have "state of the art technology" that means the nail polishes change colour depending on the light they are in. These nail polishes come in four shades and retail for £3.99. 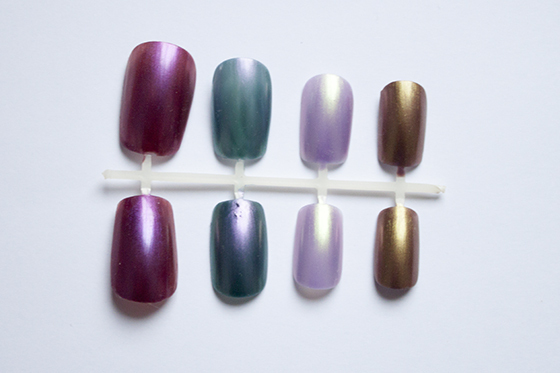 Pearly Queen is a greyish lilac pearly shade with a slight green shimmer going through it. This was the only shade which needed about three coats to be opaque but I think this would look better layered than on it's own. Royal Blue is a mid toned peacock blue which has a shimmery undertone of purple and green. Purple Reign is a plummy purple shade with a slight gold sheen going through it. Finally Gold Save The Queen is a dark gold with a green sheen to it. All the shades change depending on the lighting thanks to the duo-chrome and shimmer going through them. Metallic polish isn't to my taste, I tend to stick to creme finishes, but I have to admit I've warmed to some of the shades in this collection, Especially Royal Blue. Metallic is a big trend for Autumn/Winter and especially when it comes to nail polish. For the price they are really worth it, they apply smoothly, need two coats and dry very quickly. The brush is short and flat which makes application completely effortless. Cant rave about these enough, an incredibly reasonable on trend addition to the Rimmel range. Also I have the full set of 4 Metal Rush Polishes to giveaway, To enter all you need to do is fill the form in below! This giveaway will end a week today!